An icon for two generations of TV viewers, Jack Chase was a veteran of early TV news, combining warmth, gravitas, and charm. He was a popular news anchor on WBZ-TV from 1954-1982. A native of Sioux City IA, he attended the University of Iowa, before receiving a degree in Journalism from Boston University in 1950. His ﬁrst broadcasting job was in radio, working at KRNT in Des Moines IA. When he came to greater Boston, he ﬁrst worked in radio as well,beginning in 1949 at WCOP, where by 1953, he was the station’s news director. He then went into television in 1954 at WBZ-TV, where he spent a distinguished 28-year career. He was also heard sometimes on WBZ radio. Chase was a veteran of World War II, serving in the Navy from 1942-1945. He was also a veteran of the Korean War, interrupting his broadcasting career to serve his country. He retired from the military in 1962, having attained the rank of full commander. During Chase’s long career in broadcasting, he received many awards, for his documentaries and for his skill as an anchor. 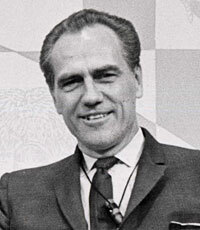 In 1973, the Massachusetts House of Representatives passed a resolution in praise of his work, and among the other honors he received was a 1989 award as Broadcaster of the Year from the Massachusetts Broadcasters Association; that same year, he also won the Governor’s Award at the New England Emmys. Chase also served as the New England President and national Vice President of AFTRA (American Federation of Television and Radio Artists). He died in 2002 at age 85.